It has been another productive week on all our local waters. Our local lakes continue to be stocked and we’ve had reports of some double-digit days for some lucky anglers. 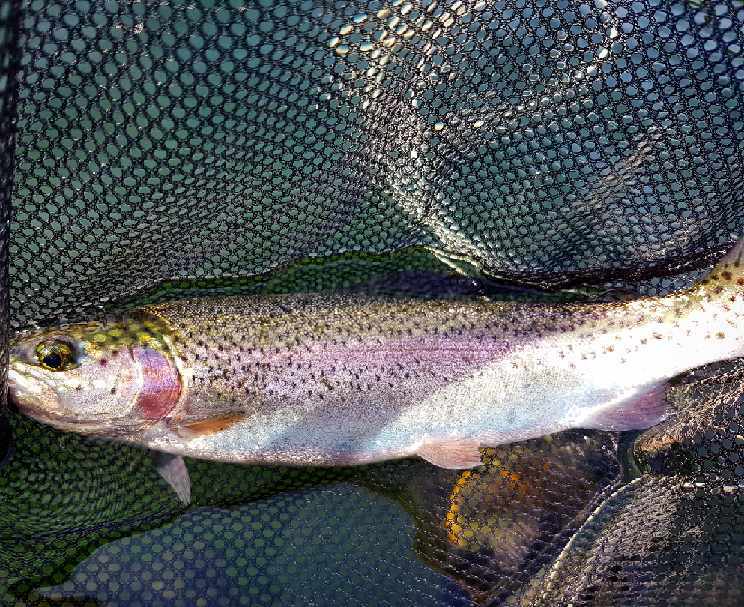 Last week’s rainy weather didn’t blow out any of the rivers and those who braved some wet days had consistent fishing. 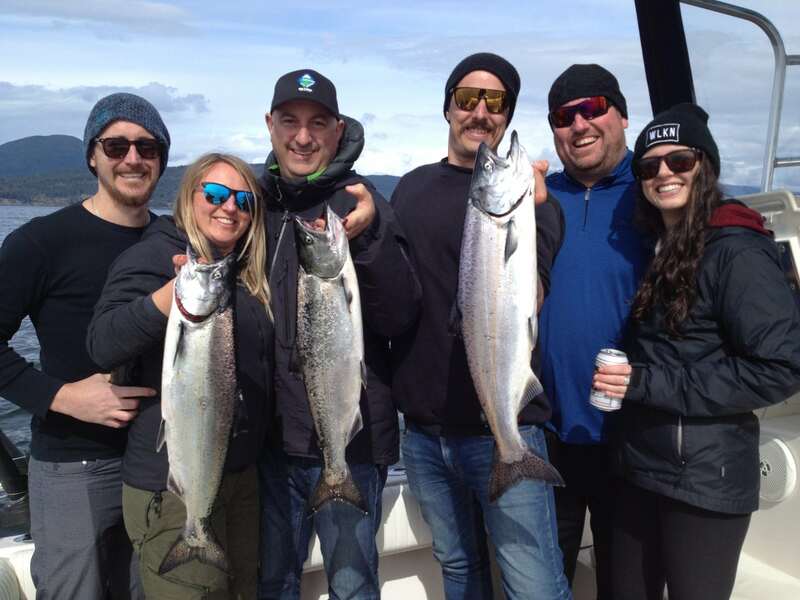 For our saltwater anglers the good fishing continued this past week in our local waters as well as over in Nanaimo to the Gulf Islands so it looks like the springtime chinook fishery is off to a good start. Jason has all the details from productive depths to recommended gear in this week’s saltwater report. Our April classes are coming to a close. There are still a couple of spots left in Matt’s Introduction to Fly Fishing Lakes Course. If you can’t make it this month he’ll be teaching it again next month. All of our May courses are listed in this week’s Classes + Courses section so if you’re thinking about your May schedule have a look. 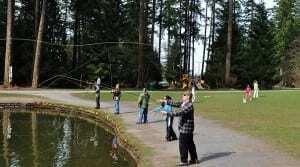 Our April classes are coming to a close for the month but there are still a few spots in this months Introduction to Fly Fishing Lakes Course. Our May courses are listed below if you’re busy planning your calendar! Despite all the rain the Vedder held up and barring a couple days of murky water the productivity throughout the week was consistent. Still lots of nice fish coming up and the water levels are set to go back to low and clear conditions with the sunnier forecast we have for the next little while. 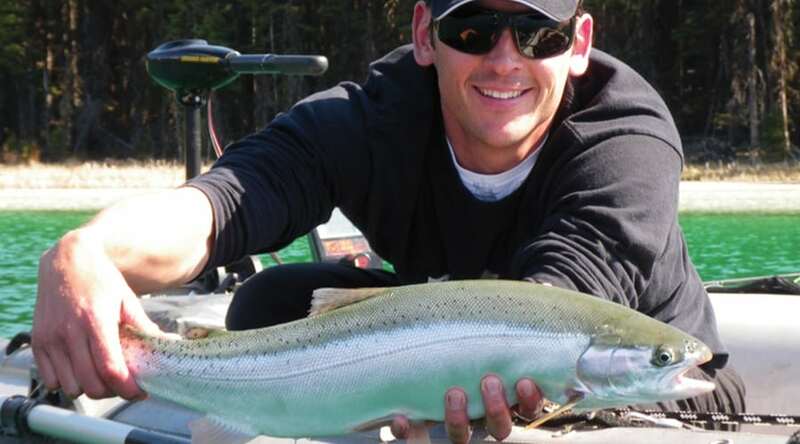 Chrome fish can be had in the lower river and we have heard strong reports of multiple hook-ups. 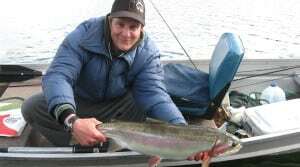 The upper river presents a different challenge as while there are quite a few stacked up, you will find a mix of fresh and coloured fish and most of them will have been highly pressured throughout their stay in the system. This doesn’t mean you can’t catch them, but downsizing your presentations and going for a more stealthy approach certainly helps with the more wary fish. Down in the lower you can get away with bigger, louder, and brighter lures, baits, and flies as the fish that have just come into the river will be more aggressive. In saying that, this is definitely not a black and white rule so don’t be afraid to do the exact opposite. For example, a big thumping Colorado blade or spoon swung in the upper river might stir up some commotion. As always, cover as much water as possible. What you are using plays a secondary role to actually finding the fish and putting something in front of it. There are a plethora of things that will get bit by a steelhead but if you need some help in getting it dialed in for the end of this season come have a chat with us at the shop! Capilano River is low and clear once again. There are still some steelhead left in the system and we heard of few early coho showing up. 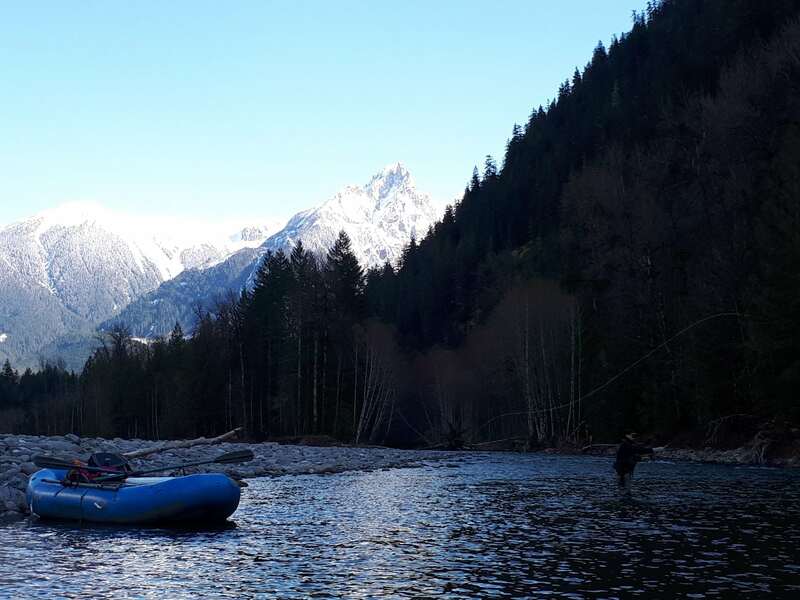 When chasing the steelhead in the Capilano River, look for walking speed water and pocket water behind structures. It is also important to use the right sized gear. 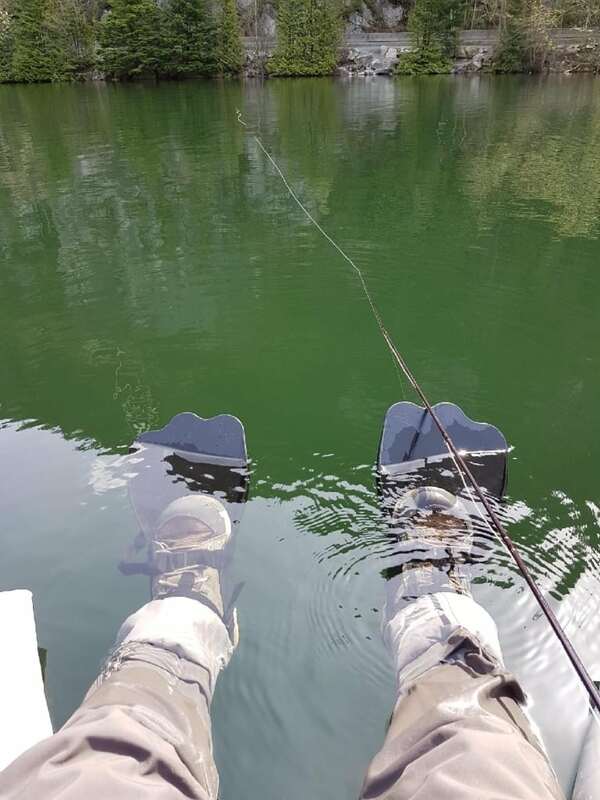 Downsize your gear when the water is low and clear. For fly guys, small prawny patterns and leech patterns might do the trick. Tossing spoons and spinners are a great technique this time of the year as more fish are active and will chase lures. Some odd coho showed up, but not many are in the system yet. We will see more coho in about couple weeks or so. Please release ALL steelhead and any WILD coho with care. The Squamish River bumped this past week, turning that nice green we all like at this time of year, but has slowly been dropping the past few days. 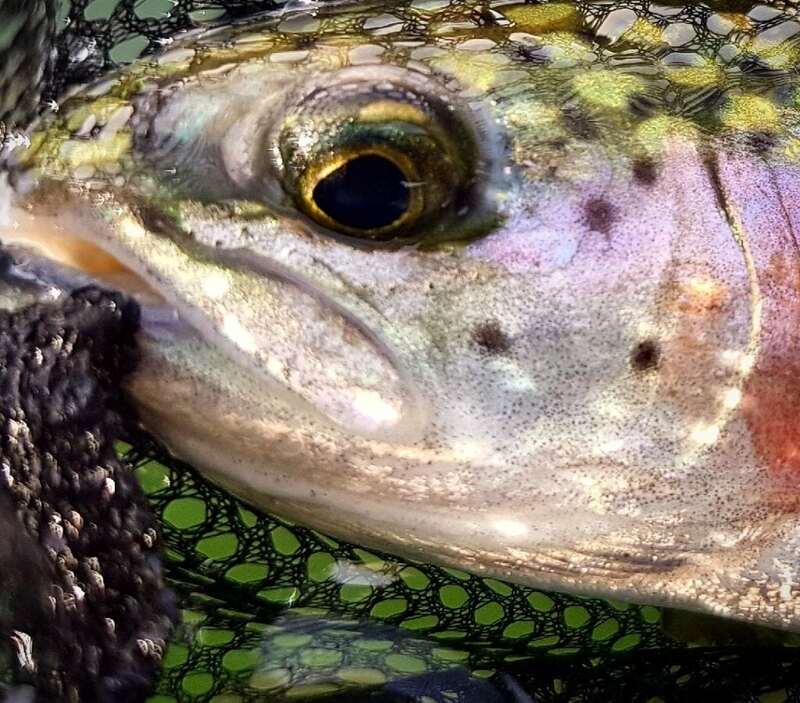 There have been some nice trout and char encountered throughout the system, and those looking for the elusive steelhead have encountered the odd one. Whether or not you’re using a gear rod tossing K3’s or swinging flies, the main thing you’ll want to do is cover water. Away from the river, lots of local lakes throughout the lower mainland have recently been stocked with the standard spring catchables. Fishing from shore can be productive, but having some sort of float tube or inflatable does help in regards to access. Quite often, we are still fishing close to shore even from the watercraft, so those who may be uncomfortable need not to worry. You’re always close to shore! Small spinners, spoons, flies, and bait (where permitted) all work. This is a great fishery for those who like to use ultra-light spinning rods such as the Elite Tech River Runner, or similar. Fly rods up to a 5wt are also ideal, with many anglers using this opportunity to fish their lighter 3 and 4wts. Despite the crazy weather patterns we have been having the fish have shown themselves quite a bit. I have been on the river personal fishing and guiding and found fish from April 8 onwards. They can be picky at times so figuring out which fry pattern is the hot one that day could take awhile before you get a reaction from these fish but the anticipation of a strike is what keeps you on your toes until that line pulls out and there is a cutthroat on the end of your fly line. Don’t rule out the bugs that are hatching as well as we head into warmer temperatures. The river is rising slowly now almost everyday due to the snow melt, it went from 8.6 meters to over 9.1 in 5 days so time is limited to have a last chance to walk and wade and catch cutthroat before the season is over and the river floods. You can fish certain spots on foot until 9.3, however if you have a boat you can keep on going until the cutthroat have migrated into the ocean. If the river stays low enough to fish then I will have another cutthroat report otherwise I am going to have to wrap up this tough and short lived season. 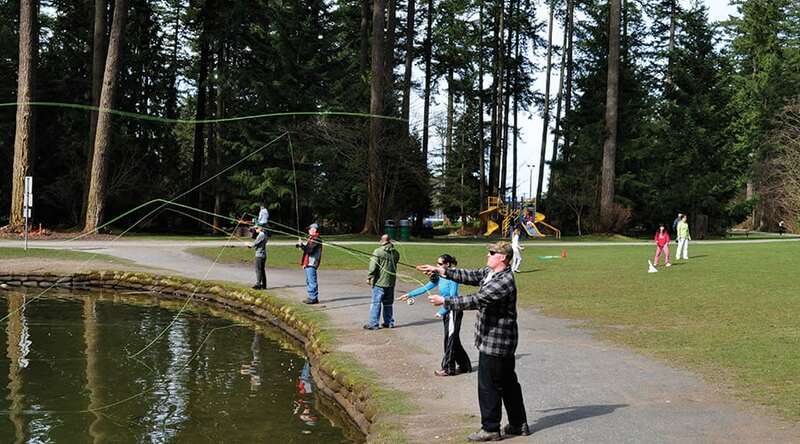 The local lakes are getting more attention as more of them are getting stocked and the weather is getting warmer. We are seeing more consistent bites and even heard of some double digit days! You can check your local stocked data on: www.gofishbc.com . This website is a great resource for stocking as well as some basic information on access and amenities for local lakes. 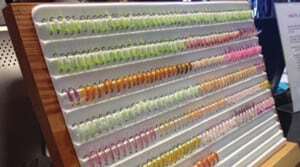 There isn’t a big secret to getting these stocked trout. A proper set up and finding where the trout are is the key. Look for surfacing fish and understanding structure of the lake will lead to a great success. Try everything from flies, lures, bottom rigs and float style rigs as trout can be keying on specific technique. For fly fishing, you can match the hatch for a better success. Please respect others fishing around you and do not leave any garbage behind when you are done. 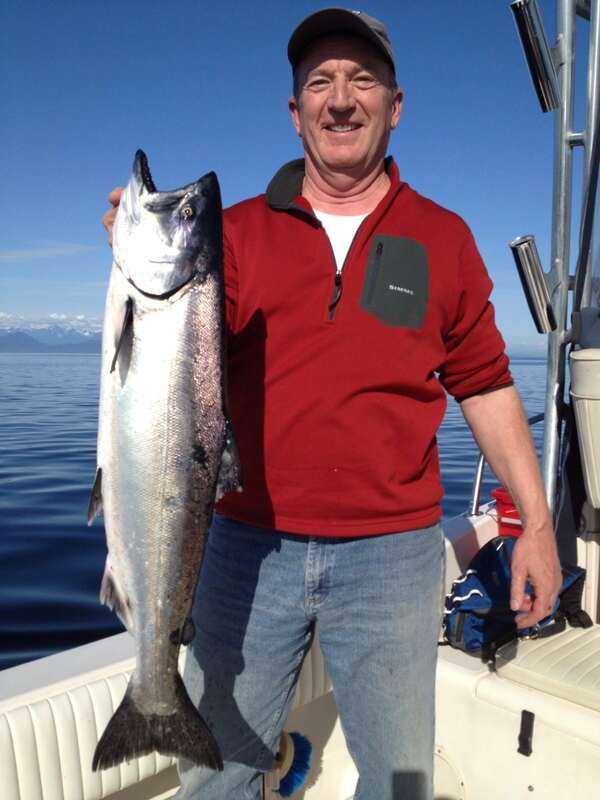 The good fishing continued this past week in our local waters as well as over in Nanaimo to the Gulf Islands. Lets take a closer look at what is going on locally. There is definitely a good number of chinook in our local waters. As usual for this time of year there is a mix of red and white springs with most of the bigger fishing being the whites. This past week there were good numbers of fish caught from the Bell out to the QA, out past the QA, and on the Hump as well. Some of the days the wind kept us closer to the Bell and we still had good catches. If the winds allow you to head further offshore, for the most part the better catches have been a little further out to the QA or out on the Hump. The water is a little dirty from algae blooms so the fish have been shallow. The most productive zone on the riggers has been from 90-120 but there have been days where fish were hit as shallow as 60 and as deep as 150. On the darker days or early in the morning you can try some gear shallower and on the brighter days you can try a little deeper early afternoon. All smiles for the GLC Whistler Crew! These fish aren’t shy, they are aggressively feeding fish in dirty water, so bright gear is the way to go. You should be thinking UV green or UV chartreuse blade flashers with glow on one side and the same thing for your spoons. Make sure the spoons have some green or chartreuse in them and some glow. You can also run bait in glow chartreuse or glow green teaser heads, and you guessed it, hootchies in the same colours will also work. This fishery is more about finding the fish and getting the depth right than a super specific gear choice. They are feeders, so if you can find them and they can see it, you are going to get them. The real challenge is that you are fishing offshore in open water and just getting on them can be tricky, so as usual, we prefer to fish artificials and troll on the faster side of things with 18 pound cannonballs and cover as much water as possible. Captain Eddie’s guest with the first of the day at Thrasher yesterday! Can’t go wrong with day’s like this over at Gabriola! We have had some very good fishing over on the other side this past week. There are a lot of fish from Courtenay/Comox all the way down to Galliano. 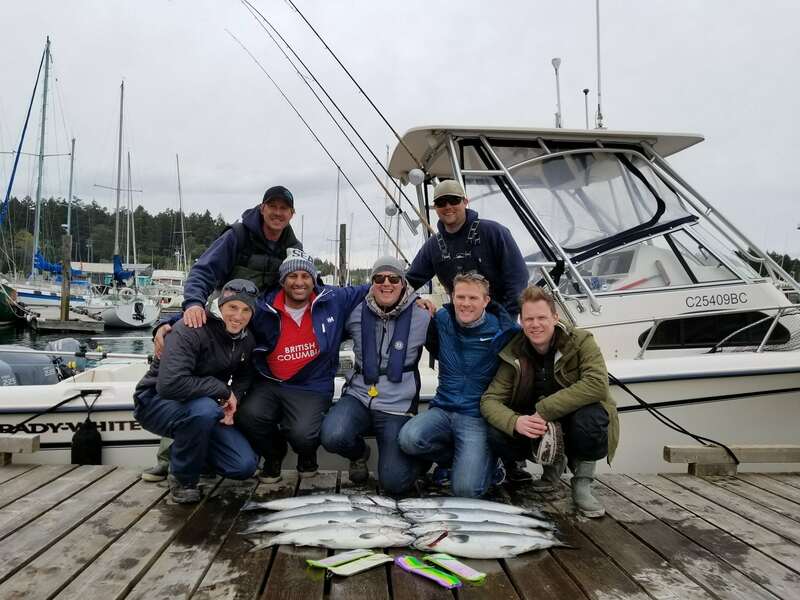 Some of those spots are obviously too far for us to get to on our trips so we have been fishing the Nanaimo and Gabriola area. The offshore fishery is in full swing and the fish are out on the “Highway” in 350-1000 feet of water. Productive depths on the riggers have been 90-130 in the morning and then as the sun gets higher around noon the better action seems to be in the 130-160 range. The water has been a lot cleaner on this side, which is normal, hence the deeper depths when the sun is up. I could see my flasher down to about 45-55 feet the other day. Productive gear can really vary between 90 and 160 feet. 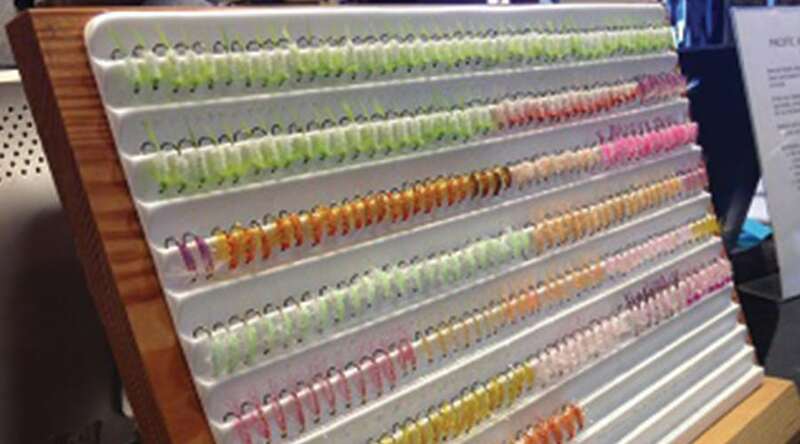 When you are fishing shallower try your UV flashers that have a bit less glow, like a Green Onion Glow or Purple Onion Glow. As you go deeper go to a flasher that has full glow on one side. As far as spoons, the Pink Sink is hot in this clear water. Other productive spoons have been Irish Cream, Homeland, Kitchen Sink, Bob Marley, and Maverick or any spoons that have similar colour patterns in the G-Force and Kingfisher series in the 3.5 to 4.0 sizes. Don’t forget your hootchies. Hootchies always work well over here, if not the best. The green splatter back hootchy was killer the other day with the STS green glow flasher at 157 on the rigger. A white UV hootchy is also productive a little higher up. So as you can see, the springtime chinook fishery is in full swing with a nice strong start, just like last year. Crabbing continues to be decent as does prawning.